I met this lovely lady through the wonders of the internet, since she also happens to be friends with Tamar, another previous wrap star. I was immediately taken in by her honesty, humour, and insight, and after looking through some of her photos, I had many questions that I wanted to ask her! Here she is! I’m so excited to be featured as a Lady Wrap Star. A little about me: I was born and raised in Chicago, Illinois, and currently live in the City Center of Jerusalem, Israel. When I’m not working, I love spending time with my friends, exploring new areas, catching up on my sleep (I’m going to be honest here), and cooking, and enjoying the company of my husband and kitty!!! How long have you been covering your hair? I have been covering my hair is November 23rd, 2012. This was the first day after I was married, and on this day, I started my ticheling adventures. Tell us a little about your hair covering adventures; What do you usually cover with? What are your general feelings about covering? How do you feel about the way other women cover and societal pressures, etc. and how has this affected you? I have over 150 individual scarves, 12 flowers of different colors, hijab caps, and little pins to accessorize my tichels. On a daily basis, I wear a solid scarf and a patterned scarf together, with little something extra, currently I’m into the flowers. I LOVE covering my hair. While I have always had very pretty hair, this is so much more fun. I am able to match what I’m wearing with scarf colors, add little accessories that show my mood, like flowers verses spikes, and sparkles are always fun. I love living in such a creative area, where women cover their hair a million different ways. 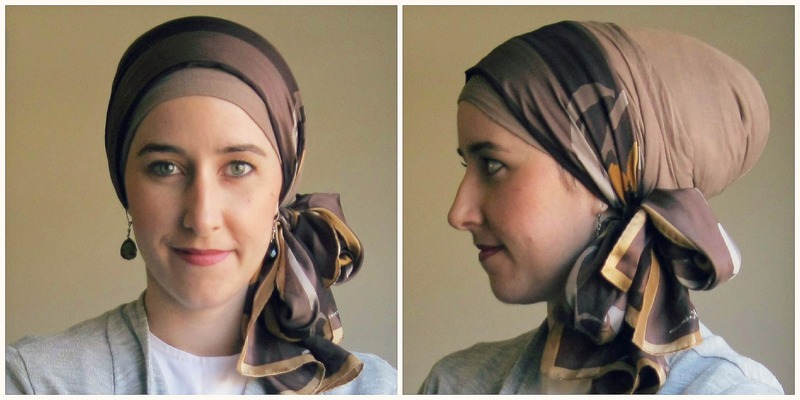 You can see women who wrap like me, wear sheitels (wigs), snoods, scarves that just cover part of their hair, and the list goes on. I wouldn’t say that I feel pressure to cover my hair, or cover it in a certain way because of other women. I do look at the beautiful sheitels that I see around me, but I won’t be getting one unless my Fairy Sheitel G-dmother gets me one. I think I’m sticking to tichels. How do others in your community cover their hair? 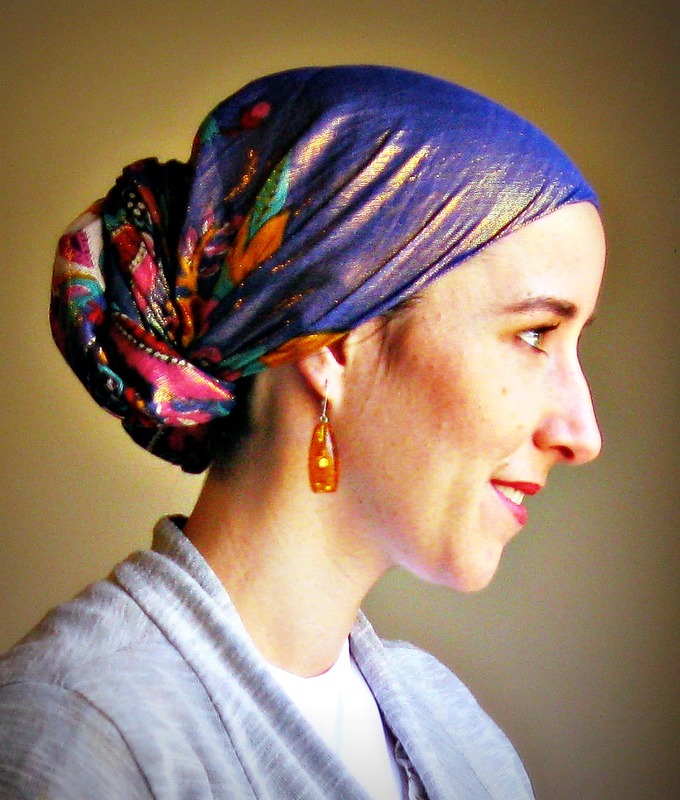 My husband and I daven/pray at Chabad of Rehavia, and so there is a great majority of women who wear sheitels, but other women like me wear tichels. Many of the younger women show some of their hair, whether it be the first inch or two, or the ponytail. I cover all of my hair, and try not to let even the stays show, but I still love how other women wrap. What are your favourite ways to tie your scarves? I haven’t figured out my favorite way to wrap my scarves, but my husband loves and requests the twist! If I don’t have the twist, and I ask his opinion, he says “It’s beautiful, but where’s the twist?” He says it’s royal, classic, and just makes the whole tichel look better. What do you look for when shopping for scarves? I try and remember the colors that I don’t have, and believe me, they exist. But in the end I have just been buying patterned light scarves, because it’s getting very hot here. I have been collecting scarves since 2004, and so I have everything from thick to thin, every solid color I can think of, and now accessories, and from all over the world. I try and examine the scarf when I’m in the store, make sure there are no snags, and no holes. Let’s hear some of your hair covering advice + tips and tricks! Sheitel bands! Buy them, buy more than one, and make sure you also have it on correctly! Don’t worry about what other people are doing, or what others think. It’s easy for me to say that because I can work in an office and wear a tichel, and in America it might be harder to do so, but overall, make sure you’re happy. 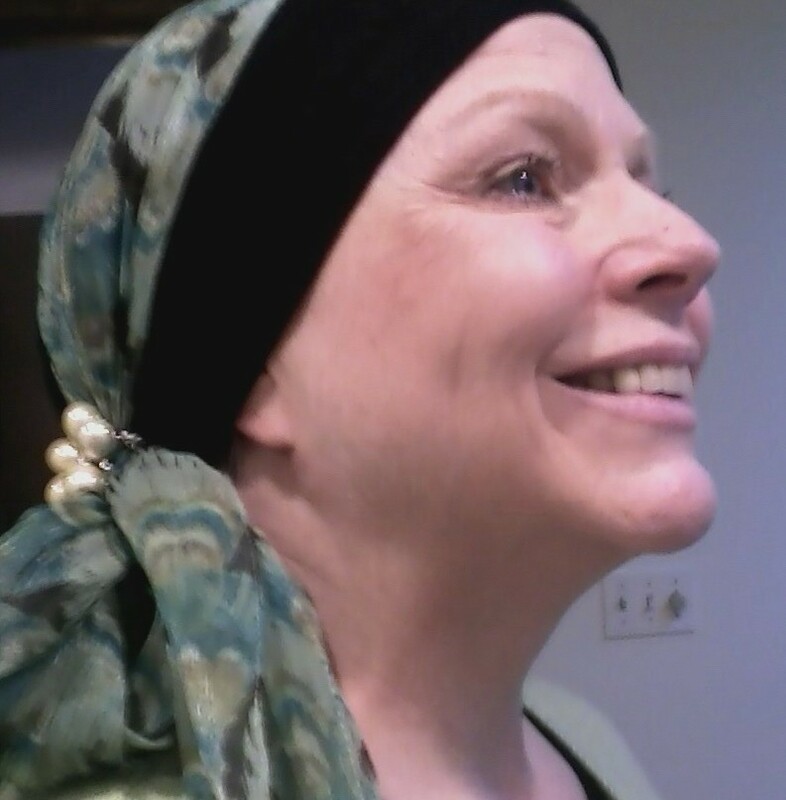 I have a friend who gets a lot of problems from people for how she covers her hair, but in the end, she has to be okay with the mitzvah she’s doing. And everyone else should bud out. Going from displaying your hair one day to covering can be hard and traumatic for some women. Don’t cover for anyone but yourself, and don’t cover any way that you don’t feel comfortable! Can you tell us a bit about your relationship with other religions/ways of life? How has this influenced you to grow and how does it affect you as a Jew? I grew up in an amazing area of Chicago which is very mixed. I learned about different cultures, religions, sexual orientations, and way of life for as long as I can remember. When I went to university for my undergraduate degree, I saw the real Chicago. Chicago is one of the most segregated cities in the United States, and while the city might not enforce this separation anymore, people tend to live by others that look, feel, and relate like they do. Long story short, I made a very serious effort to befriend and get to know the Muslim girls on campus. I love Islam, and saw the connection between it and Judaism. I also was becoming religious, and was trying to find my place in the Jewish world. My Muslim friends, especially the girls, taught me that I could be modest/tznius, but still be fashionable. They also taught me about a connection to G-d, how important it is, and that it’s not the outward appearance of being tznius that is what’s important. It’s what you do inside. I also got great wrap ideas and skill from them! And it was re-enforced a lot to match match match! Hijabis have an amazing way of making the extra color of their shoes, purse, strip in their shirt to their hijab. I only try. Has hair covering enhanced these relationships? I believe that if I lived in America, closer to my Muslim friends from university, that we’d be able to share tricks, scarves, etc. Now I just look on Facebook, Twitter, and follow Hijab tutorials on Youtube. While I’m here, ladies look at one another, and give that look of “nice tichel”. It’s in the eyes, but it’s the look of approval and understanding. A cute story was when I was in Phoenix, Arizona for my sister-in-law’s wedding. I was in a mall when I saw this woman with this HUGE wrap on her head. I have a twitter-feed, all about all kind of women who wrap, so I asked her if I could take a picture. I also complimented her on her wrap, and she looked me up and down and said “You’re pretty fly yourself!” I was very proud at that moment. What are your hopes and dreams for Jewish women and the future of the world? I don’t hope for only one group of people. I’m not sure I know how to. I would say in general, I hope that we can all just get along. In so many situations, differing groups live side by side, ride the same trains and eat in the same restaurants, and shop at the same stores. Yet they never speak to one another. How different could they be, if they are so similar as well. I just think energy could be used better, than mindless hate. In many occasions in the past, the women have been the game-changers. I can only hope, as women, and hopefully as Jewish women, we can rise to the occasion. I’m grateful for my amazing husband who puts up with a lot from me, my unbelievable relationship with my parents, and their health and happiness. I’m so grateful for my friends here, and all around the world, and all the joys and adventure this year will bring, and all the years to come. I’m also very grateful for the confidence I have covering my hair, and how it makes me so happy! Hi Rivki! Can you tell us a bit about yourself, ie how do you choose to spend your time, where do you live, hobbies, family etc.? Let’s see, where to start? We currently live in Baltimore, though we’ve also lived in Cleveland and Memphis. My “official” occupation is a stay-at-home-mom, and much of my day is spent with my three kids, the oldest of whom is four years old. So, that keeps me pretty busy! In between the meal-preparation, diaper-changing and playtime, I’m also in charge of the laundry, cooking, and general tidiness. It really is a full-time job to keep a house running, but our home is our own little sanctuary, and it gives me pleasure to work to create a happy space for my family. So, in the free time which somehow still exists, I also write and play music, do a blog and vlog for Partners in Torah, try to post weekly on my personal blog, Life in the Married Lane, participate in Rabbi Aryeh Nivin’s chabura, learn with my Partner in Torah, and play in a community band. Wow, that seems really crazy, but somehow it works. I started covering my hair when I got married a little over five years ago. When people ask you why you cover your hair, how do you usually respond? It’s been a while since anyone asked me why I cover my hair. If someone does ask, I usually offer a brief explanation about how Jewish law teaches that once a woman gets married, her hair becomes spiritually charged, and she keeps it covered to protect the holiness. The only man who gets to see it is my husband, and it’s like a special treat just for him. If the person seems interested, I’m happy to talk more about it, but generally, I keep it relatively short. What do you tell your children about it? 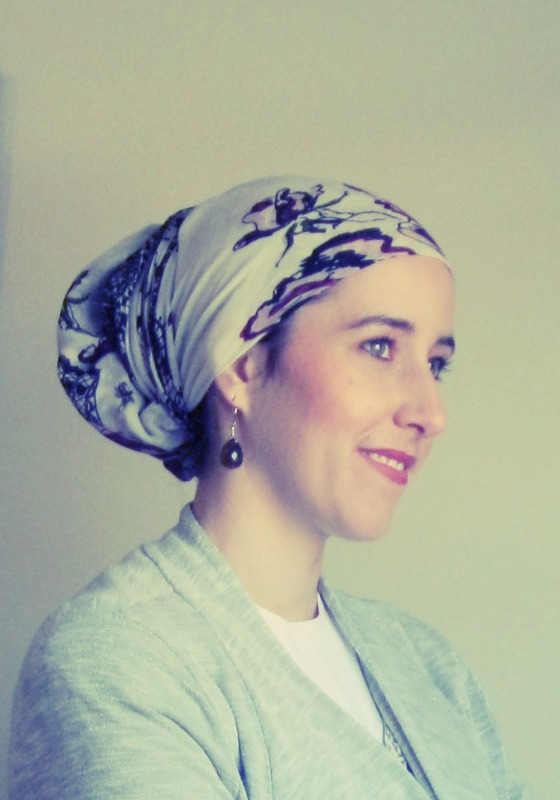 My children are still small, so we haven’t gotten beyond “Mommy covers her hair.” They know the difference between my different hair coverings (sheitel, tichel and hat), but that’s pretty much it at this point. 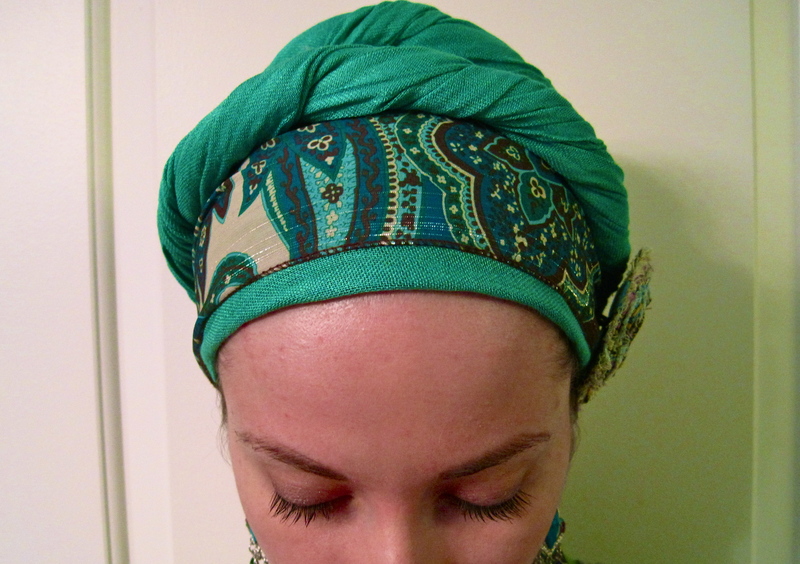 I started out using square-shaped scarves, folding them in half to make a triangle and doing a basic bun-style tichel. Sometimes I would put a stretchy headband underneath to hold it in place more securely. I like cotton-blend scarves because they don’t slip as much. In the past year or so, I branched out to rectangular-shaped scarves, which gives me a little more height, as opposed to the bun-style, which tends to be flat to my head. I have an oval-shaped face, and I’ve found that both styles work with my face. For the rectangular scarves, I like to work with a cotton-based material, as opposed to jersey. It also helps to do a big bun-style tie underneath the rectangle, to provide some volume in back. What are your favourite kinds of scarves and colours that you like to wear? My current preference is to use colorful scarves. I used to stick to more neutral colors (they match more outfits! ), but I’m trying to make my wardrobe more vibrant, so now I keep my eyes out for scarves will more personality. I gravitate toward navy blue, purple and teal. How did you feel about hair covering before you got married? What about now? Before marriage, I never really thought much about hair covering; it was just something I was going to do. Now it has become such a integral part of my life that I feel a little naked if my hair is uncovered. It’s like a part of me is missing. I love how each hair covering gives me a different look. My absolute favorite part is that it drastically reduces the amount of time needed to get ready in the morning. When I’m running out to take my four-year-old to his preschool, I can get stick my hair in a bun and pop on a hat. It is the best. If I want to be a little fancier, I can put on a beautiful tichel, and it makes me feel so regal. Much better than the washing, drying and straightening routine I had with my hair pre-marriage. Also, my hair is super-healthy now that I’m not constantly abusing it. Bonus! Do you have any funny or inspiring hair covering stories that you would like to share with us? When I was newly married, I worked in an office where I was the only Jewish woman. It was in a town that does not have a large Orthodox population, and it’s likely I was the first (and perhaps only) Orthodox women my co-workers had encountered. At the time, I only owned one sheitel (wig), and the time came for it to be washed. 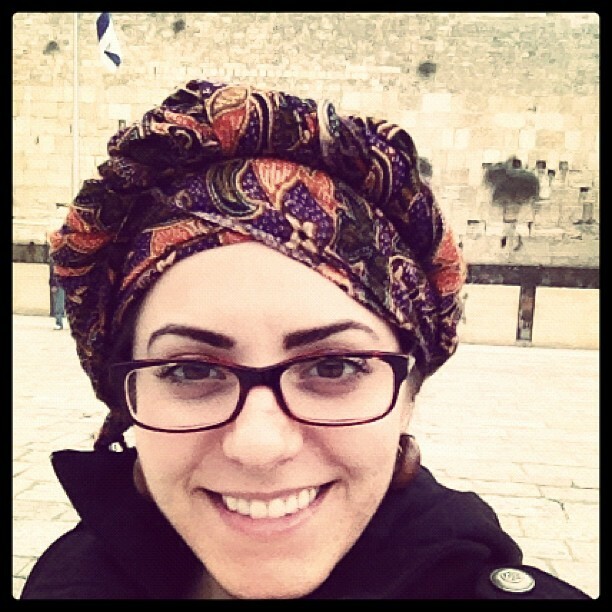 It wasn’t ready by Monday, so I wore a tichel to work. One of my co-workers asked me how many times a year I had to cover my hair. When I told her “all the time,” she responded, “but I see you with your hair all the other days.” So I revealed that it wasn’t my hair, but a wig, and she wouldn’t believe me until she was able to inspect it the next day! You have a beautiful blog called Life in the Married Lane. What made you start blogging? How has your writing style and the topics you choose to discuss evolve over the years? I started blogging when I was studying for a year in Israel. That first blog was called “Inspirations from the Holy Land.” Its purpose was a way for my friends and family to keep up with me while I was abroad. 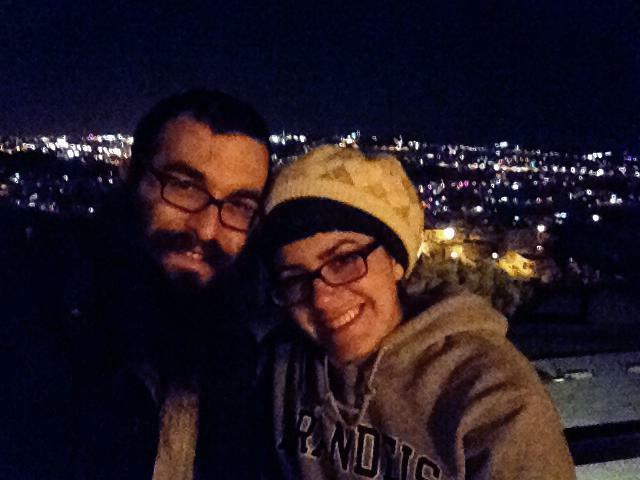 When I came back from Israel and got married, I started a new blog (I was no longer in the Holy Land, unfortunately), and it served the same purpose. That was over five years ago, and slowly, it has grown into a beautiful community of women who I am so glad to have in my life. My style has evolved because now I’m aware that people I don’t know personally are reading my blog, and that I’m kind of representing Orthodox Judaism, so it’s a certain level of responsibility. I would say I’m more thoughtful about my posts now, and take more time to try and clearly express my thoughts, to make sure that I’m accurately representing Judaism, and myself. I’ve also scaled back on sharing details about my personal life, unless I think they would be helpful or inspiring to others. I’ve started writing a lot more about Judaism than I intended, but someone my religious posts seem to be my most popular. So that’s what I’ve gravitated toward. Lately I’ve been really digging Anat Cohen, who is a phenomenal clarinetist/saxophonist/composer. She plays jazz. I heard her on Fresh Air, and I was smitten. I purchased her newest album, Claroscura, and it has been in heavy rotation. I’ve also been listening to Shalsheles Junior, which is simple and upbeat, and gets my energy flowing. Also Beethoven’s 4th and 5th piano concertos, Chopin’s preludes and etudes, Ast by Pachora (another jazz combo with clarinet) and some Yosef Karduner, who really speaks to my soul with the simplicity and devotion of his music. How do spend your time? I am a Licensed Massage Therapist (18 years) and a Certified Aromatherapist—After a long full career, I now see a few private clients, do consultations and teach continuing education workshops with Cross County Education. When on a teaching tour I am in 3 cities in three days. Lots of travel! Since I married my best friend in the world! Have you changed how you cover over time? I have shared the pictures of my collection….I love them all! 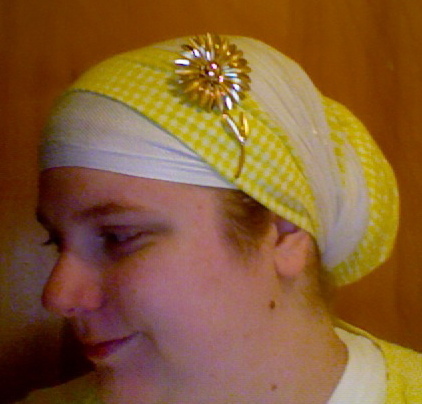 I discovered that I like volume and invested in a volumizing cotton cap for under the scarves…best accessory EVER! Today is a lazy day wrap a heavy square gold & black square folded in a triangle just tied & tucked. I have this scarf in black & red also black & teal. 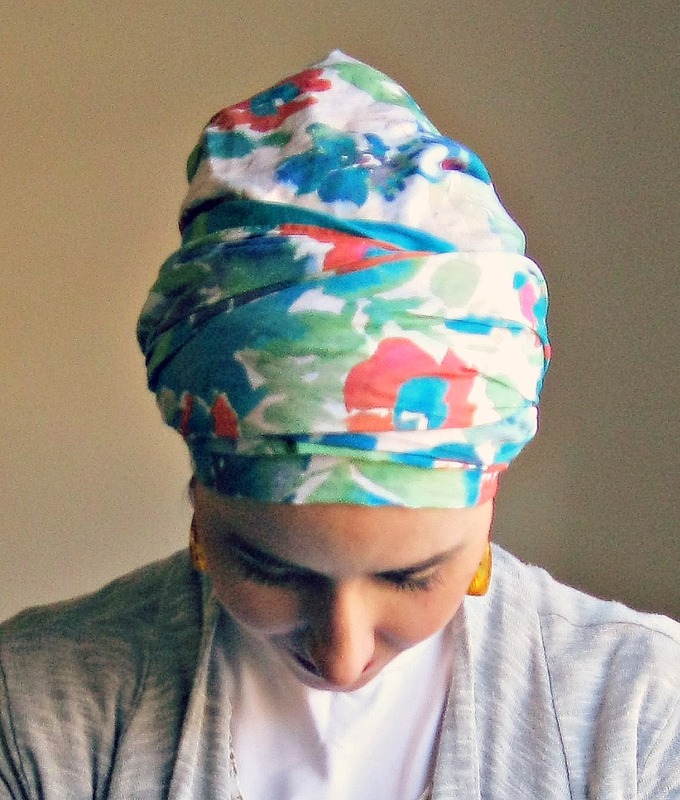 How has covering your hair affected your professional life? It may sound crazy but I feel authentic. Because it is obvious that something is different, my students & clients all know that I am Jewish. I seems that somehow this actually gives them permission to be authentic too. So far, professionally it has been a good thing. How did your family and friends react to your covering? Most of the family said nothing. Either it didn’t matter or they were following the old adage –“if you don’t have anything nice to say, don’t say anything at all.” There were a few whispered remarks from liberal relatives & friends- “Well, that’s just ridiculous!” and “Where do you think you are…in the shetel?” Some Jewish friends who had not seen us in awhile took my husband aside to ask if I had a “medical condition”?!? Any funny or inspirational covering stories you would like to share? What I want to share (especially after that last question) is the JOY I get when I am out and encounter another woman who cover. I have to travel 2 hours to buy kosher meat. When I first got to Detroit this last time I pulled up to fill the gas tank at Costco. As I was standing there the woman at the car behind me peeked around her open car door, our eyes met (after taking in the mutual head coverings & skirts) and we shared the secret smile! Any recommendations to someone that has a similar face shape and/or colouring? Don’t assume that you can’t wear a particular style until you try it. I was stuck in a simple wrap style until I met Andrea and her awesome videos—now I have a wonderful time trying new wraps! What are some of your hair covering tips/tricks/secrets? Allow yourself some “play time” to experiment—not all wraps will be sucessful….but the more you do the more you learn. My wonderful husband made a rack for me out of a wooden strip with cup hooks and I use binder clips to hold the scarves! I tend to really like to match my head wrap to my outfit and so my tendency is to gravitate towards black, ivory, gold and other neutrals, but Andrea’s artistry has got me experimenting with more colour. I am grateful for finding this group of women. The Jewish community in Grand Rapids, Michigan is small. The observant Jewish community here is even smaller. Sometimes it gets a little lonely….it’s nice to connect to so many beautiful women! I bought this scarf on a whim because light green is a colour that I’ve always liked on other people, but never thought of wearing it myself. I tried wrapping it today and… I think I like it! Definitely feeling the twists and accessories too – I am enjoying this flower pin from the gap (50 cents at a thrift shop, new with tags), and the colourful earrings. What do you think of the light green scarf? Is it something you would wear? I am so happy to introduce you to this wonderful woman. Stephanie and I found each other over the internet when she was searching for hair covering resources, and recently we got to meet in person when she made a 4 hour drive to my hair covering workshop! You can see some pictures of her at the workshop here. 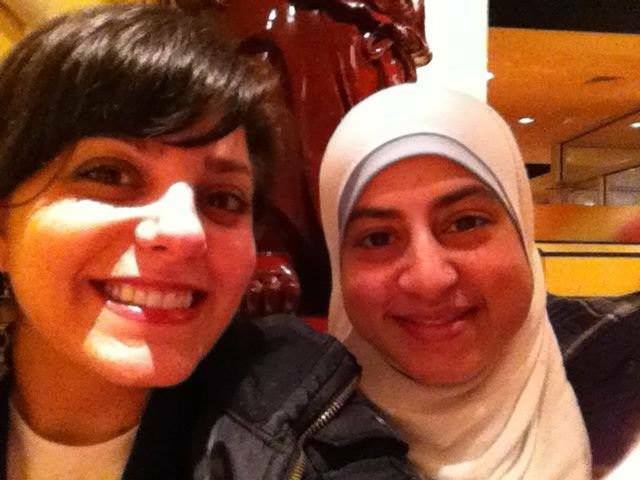 Anyway, we talked for hours before and afterward, and I am so grateful to now call her a good friend. She is hilarious, wise, warm, giving, and tells great stories! Her journey and reasons for covering her hair are quite compelling, as you will read, and she does so beautifully! Hi Stephanie, do you have any nicknames? I do, Steph, Stephers, Step-on-me (when the kids – church or family – wanna rough house), sweetie, hon, hey you, and on it goes. 🙂 The newest reference of me that I’ve heard was some little kids who couldn’t remember my name from church calling me “the lady who covers her head”. I like that one. I have been covering since approximately Nov of 2011, and I only cover part-time (we’ll get to the why). What led to your decision to cover? Well for me it’s an obedience thing. I felt as though I was being led to do it after praying and studying on it for about 6 months. When people ask you why you cover, what do you say? Do you have a long and short version of what you tell people? Yes there is a long and short version depending on how interested someone is. Short version: I choose to cover because I believe it has been asked of me in the Bible and i want to obey. How has your community responded to your covering? I live in a small town and to my knowledge I am the only non-muslim that covers in about a 50 mile radius (maybe more). That being said I do occasionally get the odd stare but typically no one seems to notice or care much, either way not a lot of attention is drawn to it, except for in church- I get ALOT of nice comments about it then – just this last week I had one of the older ladies look at my tichel and exclaim “you have GOT to show me how you tie those.” Needless to say that made my day. Any cool experiences/realizations you have had since starting to cover? I’ve realized just how much I wish to be more modest- not that I wasn’t considered modest by general standards but I desired modesty more. I realized that modesty does NOT have to be drab and boring black – but about how wonderful the things are, big or small, that you share with just that one person that makes you whole. What are your favourite scarves and accessories? Oohhh thats a toughie!! I think for me my favorite scarves are the variegated ones (I have a brown, blue and pink variegated ones) the wonderful thing about them is you don’t have to exactly match the color since all shades are included. My favorite accessories hummm I have too many to decide!! I strongly suggest a silver and gold thin scarf since these make wonderful additions in color, I make my own flowers and often pin them in on the side or back on my bun. Stick pins are terrific!! They are getting harder to find, so again I started making my own, then I make matching earrings so I have a nice cohesive look. Regular pins/brooches work – they just can be a bit harder to get in, however any pin will help hold together your layers to keep from slipping! What do you find is the best way for you to tie your scarves when you consider your colouring and face shape? I like height in the back, the BIG bun look. I don’t like height so much on the front half of my head – it seems to make my face MUCH rounder looking (so I stay away from the crown/dutch crown look). I also do a lot of the hanging tails (braided or not), I find that style helped me get used to not having my hair down to play with since I’m a hair twirler. Any secret tips or tricks that you have? ABSOLUTELY!! 3 big ones! 2 smaller one. 1) It sounds odd I know, but honestly I never use an undercap, headband or wig grip (my head is too round they slip right off), I use a pair of pantyhose!! You can leave the legs on or off- your choice (if you leave them on you can make a bun of them). When I use that I have to work pretty hard to get it to slip off. 2) You can make it or buy it, but if you have thin or short hair and want it to look nice and bigger at the back get a ‘bun enhancer’ (I bought mine at icing by claires’- and they come in multi colors and sizes) I have heard of others making theirs from a bath scrubs and even socks, so the choice is yours! 4) If you wear glasses and you keep your ears ‘in’ then make sure you don’t tie it too tight or you will end up w/ pain from the glasses digging in above your ears. 5) If you want your hair to look pretty decent when u take off your wrap DO NOT wrap while your hair is still wet. You will end up with weird frizziness and VERY flat hair. 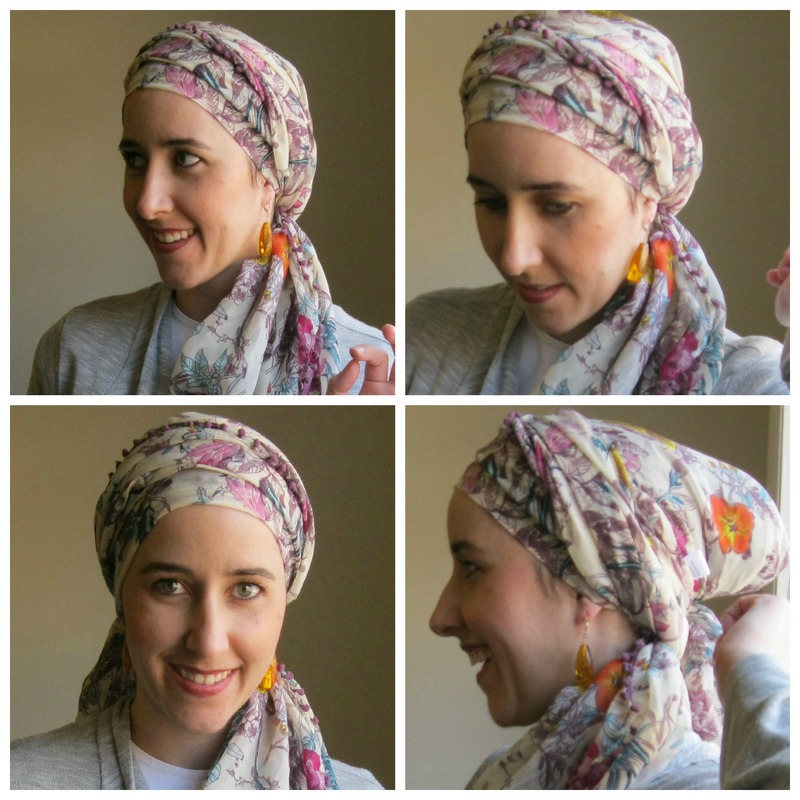 Do you match your head scarf to your outfit or the other way around? Well it depends I suppose. usually match the outfit to the scarf but if I get something new then I work the scarf around the outfit. Usually I go by mood – if I’m feeling pink or purple I’ll assemble an outfit and scarf around that. This wrap didn’t budge from dawn until late at night… even though the sash is slippery silk! To do this, I did a basic Regal Wrap -Turban with a lilac pashmina scarf, and added a silk sash in for contrast. Kept my head warm in today’s crazy rain/wind/snow!